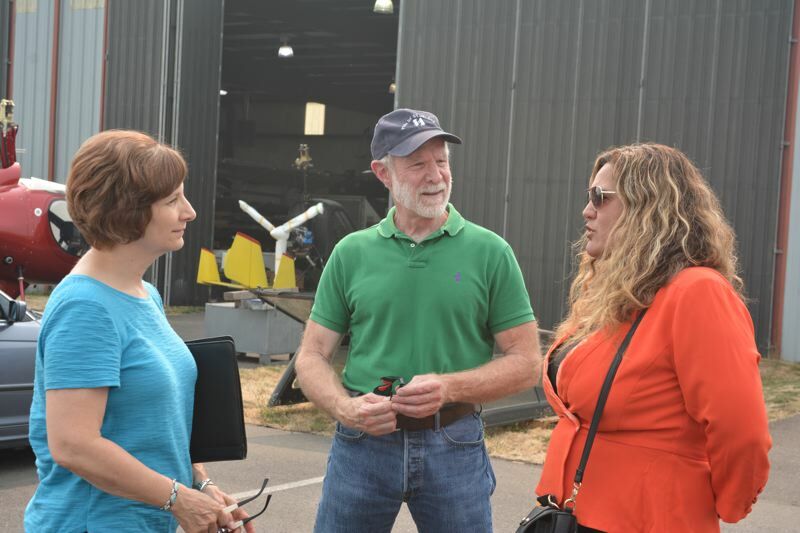 Congresswoman Suzanne Bonamici, D-Beaverton, got an update on construction and improvements in progress at Scappoose Industrial Airpark Tuesday, Aug. 14. After making the trek out to Clatskanie to visit the Seely Mint farm and announce the award of a $250,000 U.S. Department of Agriculture grant to the company, Bonamici finished her Columbia County tour Tuesday in Scappoose. Bonamici and her staff met with port officials before meeting with Sen. Betsy Johnson, D-Scappoose, and county commissioners to discuss federal infrastructure funding and Scappoose's growth. The congresswoman met with staff from the Port of Columbia County to see the makings of a long-awaited taxiway relocation project. "We're moving the taxiway 50 feet west," Craig Allison, the port's property and operations manager, told Bonamici. "It doesn't seem like much, but it's a world of change in the airport world." In the distance, heavy machinery dug into the earth, demolishing asphalt. In addition to moving the current run-up apron for aircraft, the project also includes new lighting along the area. Port officials estimate the project should be complete in November. The taxiway project is part of a master plan update for the airport and was funded in part by a Federal Aviation Administration grant. The master plan identified several areas for improvement and upgrade to accommodate a changing aircraft fleet, better suit airport tenant needs, and prepare for future uses at the airport, according to master plan documents. "We're in the process right now of trying to exchange some properties," Paula Miranda, executive deputy director of the port, told the congresswoman, explaining ongoing efforts to negotiate a land swap with developer Ed Freeman, who owns property adjacent to the airport. In addition to demolition work for the taxiway project, residents can also expect improvements to Charles T. Parker Way — the road leading into the Oregon Manufacturing Innovation Center — not far from the airport.